Over recent years Henrob has cultivated the automotive self piercing rivet (SPR) business by developing the magazine concept to feed self pierce rivets in a high volume riveting environments. 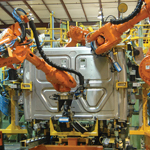 BIW (body in White) and CIW (cab in white) manufacturing programs of aluminium intensive structures typically selects Henrob as the supplier of choice for SPR. Henrob self-piercing systems are regarded as the bench mark in the industry because they offer very high levels of reliability in production and a history of zero parts per million rivet defects in service. Automotive riveting is not a new concept, Audi pioneered high volume SPR in the early 1990's. SPR is still the first choice for Audi, Jaguar, Daimler and BMW when considering aluminum intensive vehicles. Henrob's self piercing rivet is unique in the market place having been adopted across a range of automotive components not just Body In White (BIW), but Tier one suppliers commonly use a self pierce rivet in sunroof manufacturing and moon roof manufacturing. 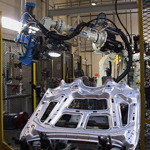 Henrob also have direct experience in designing and building turnkey robotic sunroof assembly cells. Other common applications for the self piercing process include bonnet manufacturing (hood manufacturing), Boot and tailgate (trunk lid) manufacturing. Well know vehicle manufactures including Jaguar, Landrover, Daimler, Hyundai, Ford and many others utilise low weight closures, i.e. Bonnets, Hoods, Trunk lids, Boot lids, Doors, Window regulators, Sunroofs, Air bags assemblies, Seats, Heat shields and many other applications. Hood, bonnet and trunk lid applications have even migrated down to smaller sized vehicles such as the Renault Cleo. Henrob’s involvement in the USA market is enabling greater penetration of SPR into that market for closures such as hoods but also for Cab in White (CIW) assembly lines in the truck industry. SPR is not just restricted to the automotive industry. Henrob self pierce riveting is used across a range of transportation industries including buses and coach bodies, snowmobile chassis, boats, seating on aeroplanes A self piercing rivet can be used in trailer manufacturing assembling the roof to cant rail using an automated assembly station. A single trailer can have 100's of self-pierce rivets inserted into the structure. 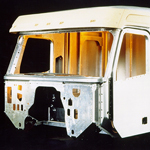 Caravan manufacturing, and the recreational vehicle (RV) market uses Henrob self-piercing rivet (SPR) to assembly aluminium structural frames.